This seminar is held in the framework of a Dutch – Ghanese students exchange program. 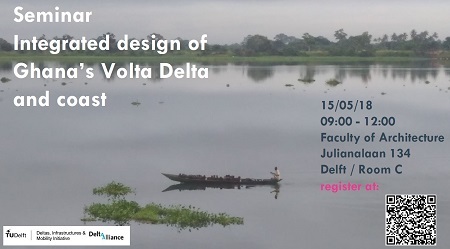 This program is a cooperation between the Delta Alliance, the Delft Deltas, infrastructures & Mobility Initiative (DIMI) and Kwame Nkrumah University of Science & Technology (KNUST), Central University (CU), CSIR College of Science & Technology (CCST), and University of Ghana (UG) aiming to develop integrated solutions for the complex challenges of the Volta Delta in Ghana. During the seminar several research projects in Ghana will be presented and the Ghanaian and Dutch student teams will pitch their research results to a group of government stakeholders connected to the Volta Delta that will be in the Netherlands at the invitation of the Dutch embassy that week. Prior to this seminar, in October 2017, a full week of workshops and site visits was hosted and facilitated by the Delta Alliance-Ghana Wing. The Dutch and Ghanaian students worked alongside to develop integrated solutions for the challenges of the Volta Delta.